This trick, also known as the flying birdcage, is a classic effect where a birdcage, containing a small bird, being held between the magicians hand instantly disappears. It may be somewhat common now for anyone who has been to a magic show, but in its day it was absolutely brilliant and unique. Invented by magician Buatier de Kolta, who premiered it at the Egyptian Hall on May 1, 1875 as “The Flight of the Cage of Canaries”. He sold a cage to Harry Kellar, reportedly for a large sum, who premiered in San Francisco on May 15, 1876, and has since been performed by many illusionists, including Harry Blackstone, who added the new feature of having an audience member place their hands on top and bottom of the cage and making it vanish between their own hands. This trick has been credited with bringing the popularity of birds – usually doves and pigeons – into the magician’s stage performance. iPad movies . Here we have another classic trick, as famous as any illusion or magic done today. This example is performed with a painting but the trick itself has countless variations, from cards to notepad scribbles, where the magician writes down what is in the participant’s mind. 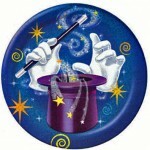 This trick can even be done in reverse, where the participant writes down what is in the magician’s mind. Either way, this is a slick trick, and while achieved through the power of suggestion and subtle guidance by the magician, it really does show how well tuned a successful illusionist has to be to human nature and human behaviour. No matter how technically skilled at the craft a magician may be, it is the audience and people side that make a career, including the powerful ability to maneuver the flow of dialog without being caught. This trick is really pretty straightforward – have someone in the audience confirm that a bullet is marked at a certain place so that it can be recognized again, have the gun independently confirmed as real. Then load the bullet and shoot your partner – easy. This trick has huger showmanship value, great shock value for the audience, and ultimately leaves the audience members all thinking the same “how did they do that” question; the one that every magician wants to hear because it means they have done their job well. The trick dates back to the 17th century, and was performed sporadically by magicians for 200 years. Then in 1918 a magician was killed by a malfunctioning firearm while performing the gun trick in London. This event ended the popularity of the bullet catch trick for nearly 70 years, and was even too much for the fearless and brash escape artist and daredevil Harry Houdini. Houdini wrote a historical account of the illusion and considered adding it to his repertoire but is said to have been afraid to actually perform it. The trick was revived by the modern illusionist team of Penn and Teller, who take this act to the max as perfect examples of how to perform a trick well as performers and entertainers and not just magic techies. As a classic trick of magic, this is perhaps the best known, or at least shares the stage with sawing a lady in half. This was invented by the late Robert Harbin. You know the effect: she goes in the cabinet, two solid metal blades are inserted and her middle section is slid over on a small tray. Her face, hands and foot are real and still in full view all the time. When done well, this trick always impresses, and in the video the audience does not seem ready to see what they think they are seeing. Televisions . The original prototype of this illusion, built by Harbin, can be viewed at the Magic Circle in London. This trick was added not because there is any classic trick of making a TV studio camera disappear – I don’t believe there is. This is not like, “Pick a card, any card…”. It is just so damn cool! See if you can figure out what the trick is, but mostly enjoy watching this clip. The ending really is just unexpected – boom! – and then you are just left scratching your head wondering if what you just saw really happened. Very cool. It is generally accepted that the first public performance of a sawing illusion was achieved by British magician P.T. Selbit in January 1921 at the Finsbury Park Empire theatre in London. Apparently sawing a woman in half has been around for long enough, and it is time to up the ante on this trick. So, how does a magician raise the proverbial bar on an age-old classic – he takes out the middleman, or in this case, middle-woman. This trick has been performed by Criss Angel and David Copperfield, is very dangerous, and certainly not one that you will see at the kid’s birthday or office Christmas parties. This trick is a standard classic made famous by Houdini in the 1950′s. There are several variations on the trick that have evolved over the years, including performing under water, doing the trick at great speed, with restraints of serious strength and even with animals such as tigers and monkeys. It is a well known illusion, relies on audience banter to be well executed, and though we may take this slightly for granted since most people have seen it performed, in its day it was a blockbuster. This posting is pure bravado by David Copperfield, one of the most talented and accomplished illusionists of the modern generation. The theme of many tricks and magic success lies in people skills – leading thought through discussion, gentle coercion and understanding behaviour and culture – all about the audience. If they buy it, then as a performer and entertainer you have succeeded. But this trick is on such a grand scale, it is all about the brinkmanship and audacity of saying that you can make a 747 or the Statue of Liberty disappear. This is magic on a big stage and certainly one of the best illusions ever performed. just simply amazing – comment as above. You have seen some good magic, but it is all the more appreciated when compared against not so good. Watch this clip to the very end frame…too funny. Great run down of some of the best big impact tricks. And I like the jokes, too. Why not do a post on some of the more accessible tricks that we can all actually have a go at? That would be cool! Thanks again for a very entertaining blog. I run a magic site and I still don’t figure how copperfield vanished the statue of liberty! Hey – I can make a quarter disappear and come out my nose – does that count?? This is a great list – i have seen doug henning and david copperfield and they were incredible. i don’t know how they did any of the tricks that i saw – i would love to see penn and teller too. they look like they would have a fun show. this is a good blog – i will keep it on my regular surfing list of sites.